The 2015 Mets won 90 games and went to the World Series. The 2016 Mets start out at least as good than the team that was in the playoffs–and the Mets that were in the playoffs were way better than the Mets that played most of the 2015 season. Yoenis Cespedes, Noah Syndergaard, Michael Conforto, and Steven Matz aren’t midseason adds this time; they’ll start with the major league club. The type of offensive depth that was added at the deadline in 2015 already exists in 2016 with the additions of Alejandro de Aza and Asdrubal Cabrera, and incumbents like Wilmer Flores and Juan Lagares. Zack Wheeler–who might have been the most touted of all the recent Mets pitching prospects–will be back at midseason. This one hurts me personally. Captain America is almost exactly 11 months younger than I am, so his aging runs parallel to mine. However, his is public, and his baseball mortality is happening rapidly. First there are the health issues. 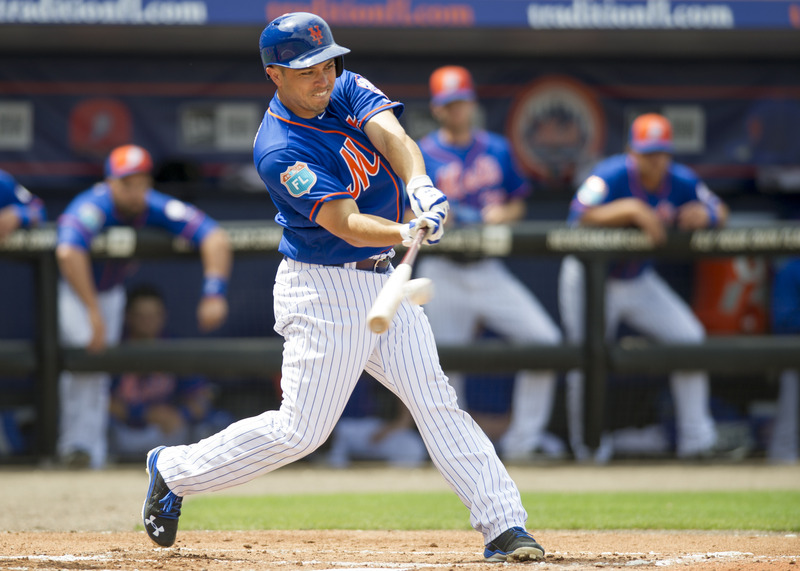 Spinal stenosis limited Wright to 38 games in 2015. His lengthy rehab to return to the field has been well-documented. More germane at the outset of the 2016 season, his involved routine to prepare his body to play everyday is both impressive, but also a warning sign. No one, including Wright or a team representative, is willing to say publicly that he thinks that Wright will make it through the season in healthy and productive fashion. Beyond the stenosis, Wright has played 150 games only once since his excellent age-27 2010 season (36 2B, 29 HR, 6.2 WARP). My bet is simply that his body will not hold up to both a full season’s worth of regular season and playoff games. In theory, it’s possible that if the Mets look headed for the playoffs in July or August, they could sit Wright for a while. However, that assumes that their playoff berth looks secure, and both Wright and the team think that such a rest would be beneficial. It’s likely that if Wright is healthy and playing, he’s going to be the Mets’ best option at third, but there are abundant signs of decline in the 33-year-old’s game. In 2015, he was productive–.315 TAv–but only played in 38 games. In 2014, he played in 134 games, but was not particularly productive with a .258 TAv and a 1.2 WARP. He’s been a below-average defender at third in six of the last eight years. That’s not likely going to be enough to take him off the field, but it will hurt his value. His contact percentage on swings at pitches inside the strike zone (84 percent) and his overall contact rate (78 percent),were his lowest since his 2010 season and his second lowest since the statistic became available in 2008. If the baseball gods are kind in 2016, the Mets should expect two men to receive an equal number of starts from the rotation’s No. 5 slot. First up is Bartolo Colon, a national folk hero who uses 83 percent of his repertoire on a fourseamer sitting 91 and a sinker that’s back to the future at 88 mph. Somehow, this works. But once July 1 or thereabouts rolls around, in will step Zack Wheeler, who turns 26 a week after Colon turns 43. After a season away recovering from Tommy John, Wheeler can return to his quite-excellent 2014 form right from the get-go, perhaps. Over the last 10 seasons, there have been 35 players who got 400 or more plate appearances while playing at least 10 games each at second base, third base and shortstop. Some of these players had a primary position but made spot appearances elsewhere, like Ruben Tejada last year. Others bounce around infield and outfield positions, like Boston’s Brock Holt. There’s no love lost between Niese and the Mets. Shunted to the playoff bullpen in favor of Steven Matz, then dealt in the offseason for Neil Walker, the Mets made it clear that Niese was superfluous to their 2016 team. PECOTA agrees in principle, projecting every member of the Mets’ starting five to outperform Niese. PECOTA’s preference notwithstanding, the Dodgers’ spring should remind the Mets that pitching depth is a necessity, not a luxury. Sandy Alderson’s reliance on a returning Tommy John patient to provide rotation depth is risky, particularly because the team apparently believes once-heralded prospect Rafael Montero will never succeed at the big-league level. Niese deserves credit as a reliable innings-eater, having made at least 24 starts each of the last six seasons. Yet there’s reason to believe Niese is more than mere depth. PECOTA may not realize that Niese is one of four pitchers to finish in the top 10 in inducing comebacker outs each of the last two seasons–the others are Dallas Keuchel, Zack Greinke and Mike Leake. Niese’s new teammate Gerrit Cole appears on the 2015 list, along with the top four NL Cy Young finishers and the AL Cy Young winner. Niese gives Pirates pitching coach/wizard Ray Searage plenty of raw material on which to perform his alchemy. Michael Conforto will not be the National League’s Rookie of the Year. (That’s not the hot take. He’s not eligible.) The hot take is that he would be if he were eligible, and by that I mean that Conforto is going to have a better season than the hot NL RoY pick and BP’s top prospect for 2016: Corey Seager. Familia was a dominant closer in 2015, and a great bullpen arm in 2014 as well. The bar for elite relief pitching is high nowadays though, as the fireballing strikeout-monsters aren’t just showing up in greater numbers in major league rotations, but in the pen as well. Familia’s 1.85 ERA last season just snuck into the top 10 for relief pitchers, and the fielding independent stats think he may have been a bit lucky; he out-pitched both his FIP and DRA by about one run per nine. But as for me, I have no idea how any major league hitter squares him up. After a performance hiccup post-All-Star-break, Familia debuted a devastating splitter that routinely touched the mid-90s. That is not a typo. Splitter. 90s. It immediately looked like a top-of-the-scouting-scale, wipeout offering*, and he pairs it with a two-seamer that can touch 99 (and moves almost as much as the split), and his plus-plus version of the Warthen slider. This is an 8/8/7 scouting profile. It is always risky to predict the next sixty innings of any relief pitcher (that is how you end up trading for Ramon Ramirez and signing Scott Atchison), but I will bet on a full season of that splitter. I do not want to be the pessimist here. I really don’t. But we need to talk about the potential for injury among at least four of the Mets’ five starters. Noah Syndergaard throws so hard that his arm could spontaneously detach and hit 60 on the radar gun itself. Jacob deGrom had a little velocity loss in Spring Training, and that gives me heartburn. Bartolo Colon is held together with duct tape, and Steven Matz has proven that the only thing he isn’t good at is staying healthy. Only Matt Harvey is a sure thing to stay healthy … you get a three-year manufacturer’s warranty on Tommy John surgery these days, right? I am going into 2016 assuming that Matz and Wheeler will co-habitate one slot in the rotation, and that one of Thor or deGrom will get the zipper mid-season. That would leave the Mets with a Harvey/Ace #2/Wheltz/maybe Bartolo/Oh No rotation going into the back half of the season, and I’d expect the team to still be competitive at that point. (They’re good!) But if that’s the case, I could certainly see Sandy and Co. to go after a relatively-cheap, relatively-good, relatively-left-handed starter to fill out the back end of the rotation. You know, someone like Matt Moore or John Lamb or James Paxton. Besides, is it really that pessimistic of me to expect the Mets to lose one of their three best pitchers and still be in the mix as a playoff team?